In a medium bowl, combine the jalapeño, taco seasoning, and water. Add the cream cheese, stirring until well blended. Cover and set aside in the refrigerator for at least 1 hour. Ushan says: This adds a good layer of flavor to the dip. Meanwhile, in a large skillet over medium heat, warm the oil. Add the cumin and cook, stirring, for about 1 minute. Add the corn and cook, stirring frequently, until the corn is tender and lightly browned, 6 to 8 minutes. Add salt and pepper to taste. Transfer the mixture to a 9-by-13-in. baking dish. Stir in the cream cheese mixture. Stir in the Cheddar cheese and bake until the cheeses are melted and the edges are bubbly, about 20 minutes. Set aside for 5 minutes before serving with the crackers or sliced baguette. I love purchasing local produce from the farmers market; on one such visit we purchased a dozen ears of local corn and I was determined to showcase the amazing corn in a recipe. 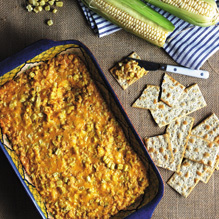 We were headed to a 4th of July party and this dip combined our favorite ingredients, corn, jalapeños, and cheese. It makes an awesome appetizer and is so easy to make. I had numerous people asking me for the recipe, and I was happy to share.